Statistics for card packs are a means of observing the rarity drop rates for cards from card packs, determining the opportunity cost of whether a player should continue to buy or not buy packs. NB: For inclusion into this article, studies recording the rarity drops of card packs should have a reasonably large sample size and should have a citable reference from a reputable source. All card packs guarantee a card of Rare or better rarity, among the 5 cards opened. This means every card pack will guarantee having at least one card of Rare/Epic/Legendary rarity, or in other words, all 5 cards will never be all of Common rarity. All types of card pack have the same chances at rarities and golden cards. Opening 100 packs from an expansion set is roughly equivalent to obtaining 75% of the cards in that set. 100 packs is approximately (98/98) Commons, (64/72) Rares, (20/54) Epics, and (4.5/20) Legendaries (taking Mean Streets of Gadgetzan as the example set). 100 packs from an expansion set is roughly equivalent to 40% of the total dust value of the expansion. According to the meta-study data in this article from 2015, the average number of packs to open before receiving another Legendary card is 18. Cards are decided during the opening of packs, not during the moment of purchase. A case has been made for "predetermined rarities" when opening packs "again". This probably means that Hearthstone uses some method of seeding that allows it to determine the rarities of a player's future cards well in advance, and snapshots of the seeding progress are cached periodically server-side as a back-up mechanism in case of a system or database failure, as is what happened in China. However, using the data showing the probability percentages of opening cards belonging to each rarity type, a user-generated "pack opening" simulator can be created. Employing Monte Carlo repeated simulation of such pack openings can yield information as to the average number of "missing" and "extra" cards a player may receive from opening "n" packs. Information as to the amount of dust obtained from disenchanting all "extra" cards obtained from such packs can also be obtained. Other simulators may base their simulation on guesses as to how individual cards are selected to be opened from the card pool. The raw data obtained from this article can be used to either debunk or verify such hypothetical user-generated pack opening simulators. As seen with the Tri-class card opening bug on December 1, 2016, in which Tri-class cards had a higher than normal chance of appearing in packs, there appears to be a card-opening variable based on "Classes". China is, by law, requiring games which feature random drops purchasable by money, to publicly release the drop rates/statistics for those random drops, effective May 1, 2017. This includes Hearthstone. RARE - At least 1 rare or better in each pack. EPIC - Average of 1 every 5 packs. LEGENDARY - Average of 1 every 20 packs. Changes to pack opening logic, starting with Knights of the Frozen Throne (2017-06-22). When opening a new Legendary, it will always be a Legendary you do not own yet, unless you already own all Legendaries from that set. This mechanism does not distinguish between normal and golden cards. Example: You own a golden Ysera. You will not find any Ysera (golden or non-golden) in any future Classic pack, until you own at least one copy of all Legendaries from the Classic set. After that, you may find another Ysera, which may or may not be golden. A card pack will never include more copies of a single card than what may be used in a deck. In other words, there will never be three or more copies of a single Common, Rare, or Epic card, though you might still find two copies of a card that you already own one or more copies of. Once you have all Legendaries from a set, this same guarantee should also ensure that you do not get more than one copy of the same Legendary in a single pack. 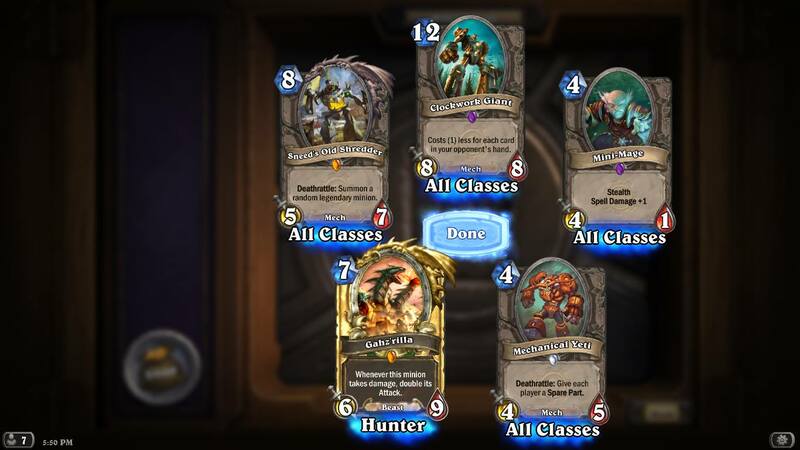 When opening packs from a new set, at least one Legendary is now guaranteed within the first 10 packs. This might be achieved by initializing the Pity Timer to 30 for each new set, or setting the Pity Timer to 10 for the first 10 packs opened in that set. The first two changes should not include the overall distribution of cards in packs; the last change will result in a small increase of the number of Legendaries. The relative increase will be higher for players opening few packs, and lower as a player opens more packs from the same set. There is strong evidence that a "Pity Timer" exists, which defines a maximum number of packs that a player opens before guaranteeing the next Rare/Epic/Legendary card. This Pity Timer counter is tracked individually for each store-bought expansion set, including Classic set. "In adherence to new laws, Hearthstone is hereby declaring the probabilities of getting specific card rarities from packs, with details as below. Note: Each Hearthstone pack contains cards of 4 different rarities. In addition, please note that as players open more packs, the actual probability of opening cards of a higher quality increases in tandem. [my note: for those asking for clarification, this is very likely referring to the pity timer]"
An Epic card will be opened within 10 packs of the last opened Epic, for that set. A Legendary card will be opened within 40 packs of the last opened Legendary, for that set. Pitytracker.com has also compiled their own card pack opening statistics for each expansion: pitytracker.com/insights. In addition, Blizzard announced that beginning with Journey to Un'Goro, players are guaranteed at least one legendary card in their first 10 packs from any given expansion. Combined with the usual 40-pack pity timer, this implies that if a player buys a 50-pack bundle, they're guaranteed at least 2 legendaries, and can reasonably expect 3 or more. According to the below meta-study's data tabulated under the "Golden cards" section, the average card pack has a disenchanting value of 102.71 Arcane Dust. Each card has an average disenchanting value of 20.54 Arcane Dust. The expected leftover dust from buying a specific number of packs for a set will be defined here as the amount of dust a player receives when he/she has opened "n" packs for a set, and has disenchanted all extra copies. The amount of expected leftover dust a player receives from opening 70 packs is about 1600 dust, or about 23 leftover dust per pack. The amount of expected leftover dust a player receives from opening 100 packs is about 3000 dust, or about 30 leftover dust per pack. Moreover, if the player decides to disenchant more cards (cards which are not extras) which the player presumes to have no use for, then he/she will be expected to obtain more dust than the values calculated above. A player can approximately calculate his/her leftover dust for a set by doing the math themselves, given the number of packs they purchased and given the amount of dust before and after the purchase. Include the disenchantment of extra golden cards before observing the dust difference on the "Mass Disenchant" button. The following numbers combine data from several other studies on this page. Since it has at times been suggested that the distribution of cards has changed over time or is different for different expansions, the numbers are shown per expansion. Note that all data collection has been done for each expansion when it was the most recent expansion, so there is for example no data available for card distribution in Classic packs that were openend after the release of Goblins vs Gnomes. This produces a total sample size of 32,697 card packs, describing 163,485 cards in total. This table shows the likelihood of any single card being of a given rarity. The differences in the percentages appear to be all within the boundaries of statistical variance. This suggests that, at least up to and including the Un'Goro expansion, there have been no changes in the distribution of cards per rarity. * Note that the sample size for Goblins vs Gnomes & Knights of the Frozen Throne are probably too small to be statistically relevant. Disregarding the data from GvG (which is statistically irrelevant because of the small sample size), it appears that the chance of receiving a golden common card has been slightly increased as of the Old Gods expansion, while simultaneously lowering the chance of a regular common card. In other words, the chance of a common is unchanged, but any common card generated has an increased chance to be golden. This data again shows the increased chance of a Common card being golden since the Old Gods expansion. The seemingly erratic changes in the chance of a Legendary card being golden are probably a result of the relatively low amount of legendaries in the data, making the data statistically less trustworthy. However, it cannot be ruled out that the rules for generating a Legendary as golden or regular have been changed by Blizzard. Only a single data set (the HearthSim data) tracked the class of the cards openend in addition to their rarity. Fortunately, this data set by itself is large enough for statistical relevant. However, this obviously means that there is no way to verify whether there have been changes in distribution across the classes over time, and whether the same pattern applies for expansions other than TGT. The table below shows, per rarity and by class, the average number of times each card was opened. (Example: A total of 3,227 Common Mage cards were openened; since the TGT expansion includes 3 Common Mage cards the average number per card is 1,075.67). The variations in the numbers are all within the boundaries of expected statistical variance. This suggests that the pack opening algorithm does not favor any specific class, nor neutral cards over class-speecific cards. However, that does not mean that there is an equal chance of finding any class or neutral; it means that any card of a given rarity is equally likely to be found. Since TGT (like all other expansions) has more neutral cards than it has class-specific cards, the chance of getting a neutral card is still higher. On June 5th 2014 Steve Marinconz published the following results in an article on Kotaku.com. The data was collected by aggregating the results of numerous card pack opening videos found online, with a total of 1,000 packs. The study used only videos filmed in the last two months. * NOTE: The data in this row is as published in the article, but appears to be incorrect. According to these numbers, the chance of finding at least one Rare or better card in a pack is (73.11 + 19.73 + 6.33) = 99.17%, which is inconsistent with the guarantee of at least one Rare or better card. Apparently Marinconz computed these figures from the "Percentage of total" chances, based on the assumption of a flat distribution; however the "at least 1 Rare or better" guarantee invalidates this assumption and hence these numbers. Based upon this data, Marinconz provided some interesting 'fun facts'. While these are based on the results of this single, relatively small study, the closeness of the study's results to those of other and larger studies suggests that the below information should still be relatively accurate, at least for the lower rarities. Unfortunately, Marinconz only posted aggregated data. Without data about individual packs, it is not possible to use this data for the "Probability of at least 1 per pack" table in the Meta-study. Also, since Steve didn't publish the exact number of golden cards, this study has also been excluded from any of the tables representing the chance of golden cards. In August 2014 E. R. Kjellgren published an investigation into the rarities of cards found in card packs. This was achieved by collecting user data from forums regarding the contents of 11,359 different card packs. The author notes that the investigation suffered from two main problems: the information collected was anonymous and its accuracy cannot be guaranteed; and the sample size, while adequate for the lower rarities, is still smaller than might be desired for the higher rarities. Kjellgren also divided rarities into golden and regular versions. Based on the data below, the average card's dust value is 21.51 dust. The average pack's dust value is 107.54. The data showed golden cards to be on average around 30 times less common than regular cards. However, the proportion of golden and regular versions varied substantially by rarity. The author also notes that the sample sizes for the higher golden rarities are too small to be considered conclusive. Unfortunately, Kjellgren only posted aggregated data. Without data about individual packs, it is not possible to use this data for the "Probability of at least 1 per pack" table in the Meta-study. The average card's dust value is 21.22 dust. The average pack's dust value is 106.10. Unfortunately, the sources for this pack opening only include aggregated data. Without data about individual packs, it is not possible to use this data for the "Probability of at least 1 per pack" table in the Meta-study. The average card's dust value is 19.65 dust. The average pack's dust value is 98.25. The average card's dust value is 21.11 dust. The average pack's dust value is 105.54. The average card's dust value is 20.33 dust. The average pack's dust value is 101.63. The average card's dust value is 20.73 dust. The average pack's dust value is 103.63. The "tri-class bug" was a time when, during the opening day for Mean Streets of Gadgetzan, tri-class cards had a higher chance of being opened from packs than other cards. The raw data here was collected from the original Twitch VOD, not the YouTube video referenced above. It is unknown whether the YouTube video catches all of the pack openings, since there were a lot of segues in-between pack openings, so the creator of the YouTube video might not have caught them all. Of the 896 packs, 6 were from the 3 promo quests. The average card's dust value is 21.00 dust. The average pack's dust value is 104.99. YouTube video should include the first 300 of the pack openings. The last 150 pack openings were opened the day after the YouTube video was created. Data was recorded by watching the original two Twitch VODs, not the YouTube video. The average card's dust value is 21.57 dust. The average pack's dust value is 107.86. The data shows that golden Rares, all Epics, and all Legendary cards appear more frequently in Journey to Un'Goro when compared to the data in HearthSim's August 2015 study for The Grand Tournament. The data shown here is somewhat similar to the data gathered during Whispers of the Old Gods, with the exception of golden Rares appearing more in Journey to Un'Goro than in Whispers of the Old Gods. Data was recorded by watching the original Twitch VOD. Refer to Kripp's YouTube channel for video footage of the card pack openings when the Twitch video eventually gets deleted. The average card's dust value is 20.88 dust. The average pack's dust value is 104.38. Data was recorded by watching the YouTube video. ↑ Hearthstone Products - Card Packs - Battle.net. Retrieved on 2017-03-27. ↑ Sample pack opening images: 1 Legendary, 4 Commons, 2 Legendary, 2 Epic, 1 Common. ↑ Hearthstone Fireside Chat Goblins vs Gnomes. (2014-11-07). ↑ Ben Brode on Twitter. (2014-12-04). ↑ Ben Brode on Twitter. (2017-02-03). ↑ Pity Tracker Guide. (2015-12-01). ↑ Simulation run by User:Aegonostic, using the meta-study data that existed in this article in early 2017. ↑ Hearthstone Mathematics (July 31, 2018). 20 FACTS about Hearthstone PACKS! The Boomsday Project: How many packs should you buy?. Retrieved on 2018-08-06. ↑ Ben Brode on Twitter. (2015-12-21). 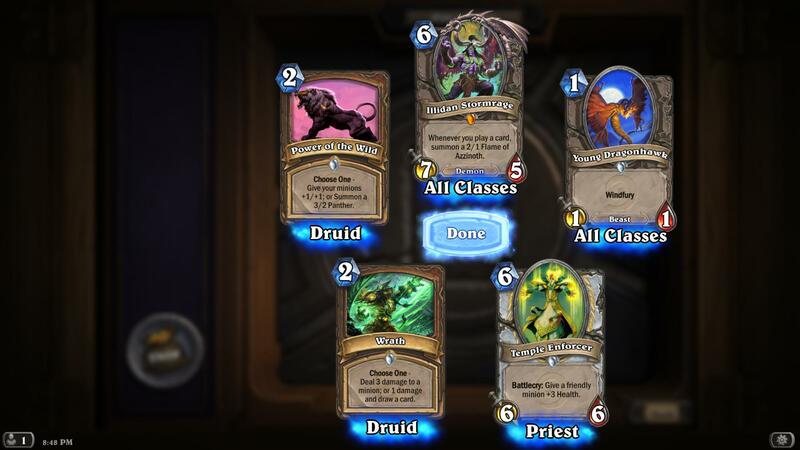 ↑ Hearthstone Packs Hypothesis for "Predetermined Rarity" - Reddit. (2017-01-19). Retrieved on 2017-01-19. ↑ China will force games with loot boxes to publicly expose their drop rates and probabilities - Reddit. (2016-12-08). Retrieved on 2017-01-19. ↑ Official Card Rarity Drop Probabilities from Packs. (2017-05-05). ↑ Hearthstone Update: Upcoming Card Pack Changes. (2017-06-22). ↑ 15.0 15.1 Pity Timer on Packs Opening analysis (Kinda proofed) - Reddit. (2016-01-03). ↑ Continuing Info on Pity Timer - Reddit. (2016-01-06). ↑ Calculated from this article's table by User:BigHugger. ↑ 19.0 19.1 Simulation run by User:Aegonostic (2018-10-12). Golden cards and the new legendary-opening rule are factored in. ↑ Kripp checks tri-class card amount. (2016-12-01). This page was last edited on 11 April 2019, at 21:13.